The academic community might have an opinion about MOOCs that is based on their bias and preference for classroom attendance and instruction. MOOCs have become popular in the past couple of years since they are Internet based and cost very little and claim to provide global access to quality education. The expert designed short lecture video directly compete with the academia offering which is very expensive. The backlash might be centered around the follow through or perseverance of the course and the non-proctoring of the assessment and the overall resistance of the faculty to be controlled by new policies. What do you think the future of MOOCs is? Mobile learning is the sine qua non of next generation learning. The power of the mobile devices in terms of computational, visual and communication is phenomenal and is doubling every 18 months. Why would you not want the power of an office computer and the flexibility of using it anywhere you go. My best study times is in seat 15D of American Airlines while connect to WIFi at 30,000 feet. A harbinger for adoption can be found where I work. We are adding 50,000 mobile devices our network of users every single week. All of these devices have well defined lessons available on a variety of topics. So my view once again is beyond the classroom and indicated a very high adoption rate for mobile learning. Gartner happens to agrees with me on this too. Are these things you feel are going to be beneficial or will there be a backlash? The benefit is found in the value chain created by the using community. The benefits of learning are well defined. Life changing, wealth creation, economic development are just a few of the positive extensions of MOOCs and mobile devices. There are few backlashes today. Either a product or service is accepted or it is overtaken. When is the last time you went to BlockBuster or the last time you used a “pay” phone? I do not see a backlash in the future for either MOOCs or mobile learning. All boats rise with the technology wave. 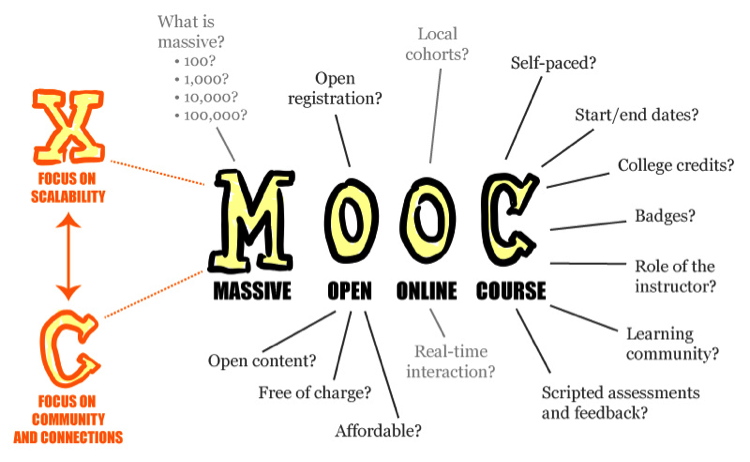 MOOC is massive, open, online and structured as a course. I like that graphic which speaks to the interpretation of the four letters (see below). Massive can be in terms of the number of people who have access to the course or it could imply a massive number of connections within a community. Either way, it is not a small-scale undertaking. Without advanced technology, there is no way to scale such a course delivery and we all know that technology is continuing to grow at a very fast rate. The Internet is being deployed with satellite and drone technology to provide connectivity around the globe. Major cities across the USA are providing community wide Wi-Fi enabling a plethora of new services. The first O in MOOC is for Open. This can mean open to all, open to being no or low cost, open content, which Is easily contributed. This fits nicely with the ideology of open source software and tools. The second O is for Online. That is a given today. It is the sine qua nan of distance education. The C opens a lot of different expectations for how a course is created and delivered by the instructor and how it is used and shared by the learning community. There is a lot of support for bringing quality education to the world. The Khan Academy has as its mission to provide world-class education to the entire world for free. The MOOC approach is just starting to move forward and it will continue to be disruptive the status quo educational systems. A number of the very top rated universities have formed MOOC consortiums to enable the transition. Mobile is just one component of the new information paradigm shift. We have been constricted to our computers for years until the notebook computer arrived. Those devices have been transformed into tablets and handheld smart phones. You will probably stop calling them phones in the future and just refer to them as your communication device. The next wave of mobile devices will be found in glasses and clothing and projection devices. Bank of America is adding 50,000 new mobile users to their online banking system every week. 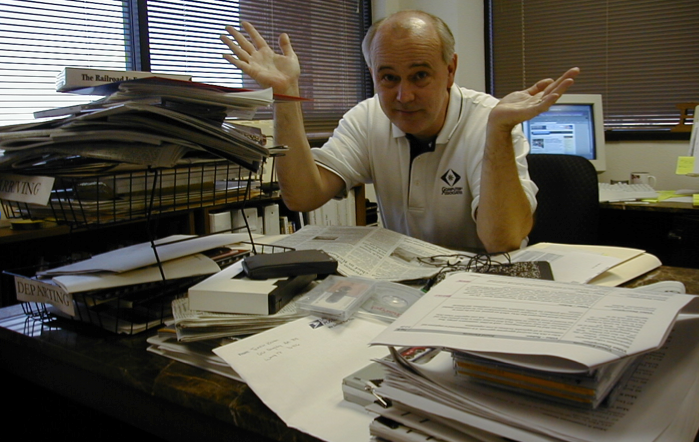 There is no second guessing the future use of online and portable information devices. Sinur, J., & Hill, J. B. (2010). Magic quadrant for business process management suites. Gartner RAS Core research note, 1-24.